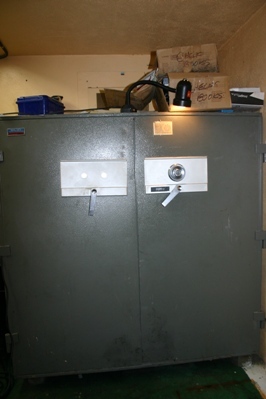 Bill's Lock, Safe & Security was called with a request by a client to open three safes that were in a warehouse in Secaucus New Jersey. The warehouse was being cleared out and the combinations to the safes were unavailable. 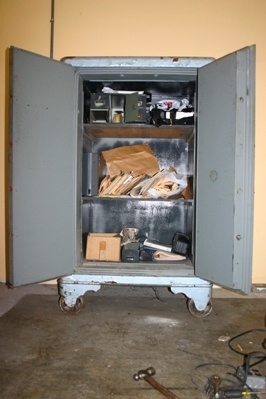 The three safes were an old Mosler, a Diebold and an ISM High Security safe with a smaller safe inside. 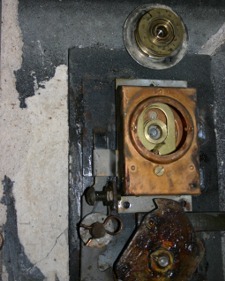 In a day and a half, Bill Kushnick was able to open all four locks and restored all of the safes to good working order. Bill's Lock, Safe & Security is a full service Security Engineering Company. Company Owner, Bill Kushnick has been helping clients with their security needs since 1982. Bill's Lock, Safe & Security is a full service Security Engineering Company. Company Owner, Bill Kushnick has been helping clients with their security needs since 1982. Bill services all of NJ, NYC, CT, MA and Eastern PA.
AMSEC fire safe repair Summit, NJ 07902. This is a fabrication of which I am particularly proud. Bill’s Lock, Safe & Security was called in to upgrade an AMSEC fire safe that was mounted in a wall in a house in Summit, NJ 07902. 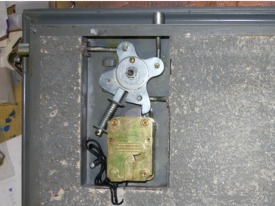 The safe had a simple straight tailpiece combination lock and a key lock. The key is actually the handle as it retracts the bolt work and gives the user something with which to pull open the door. In this case, the combination lock had given the owner trouble in the past and someone had removed the wheels from the lock. Only the small key was securing the safe. We removed the door and took it to the shop for fabrication. First, we did not want to rely on something as small as the key for the handle. I did a full machinists drawing of the plug of the key lock and had a new “handle arbor” made from stainless steel at a machine shop. While they were making that custom piece of me, I fabricated a lock mounting plated from steel and welded it to the inside of the door. 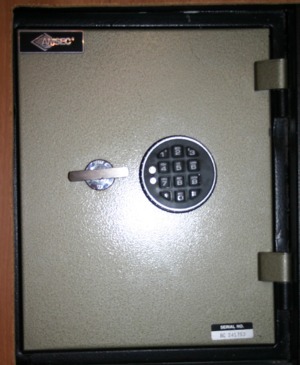 To it, I supplied and installed a LaGard 33E ComboGard electronic safe combination lock. I then cut and attached a blocking bar to the bolt carrier bar so that it would engage the bolt of the new electronic safe combination lock. After I got the piece from the machinist, I installed it in the shell of the original key lock, attached the bolt carrier bar, indexed the assembly and finally, welded a stainless steel flat bar onto the arbor to create a handle. 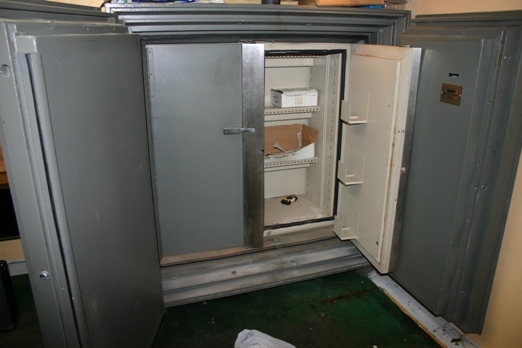 We reinstalled the safe door and tested everything, it works great! 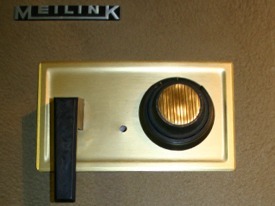 This is a Meilink safe that we opened by drilling up in Pequannock, NJ 07440. The existing combination would not work and the woman who owned it said that she felt a little snap when she last locked the safe. 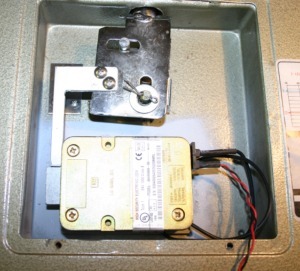 With a well placed, single ¼ hole, we quickly opened the unit and discovered the problem. The number two wheel in the combination lock came out in three pieces even though it was made of plastic. 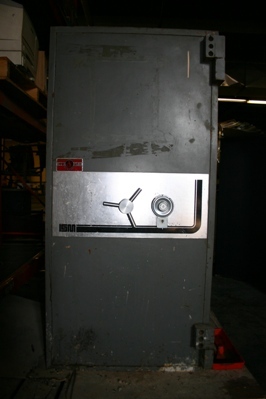 We took the safe door to the shop, welded shut the hole through the door and fabricated to install a LaGard 3650 swingbolt electronic combination lock. 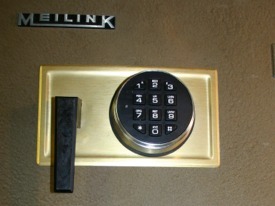 Now the owner does not have to dial the safe lock open, she just pushes buttons and turns the handle. At a tire and auto center on Westfield Avenue in Roselle Park NJ 07204, Bill’s Lock, Safe & Security was called upon to repair an old Mosler safe. 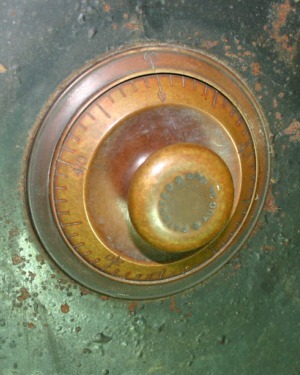 The safe had a long discontinued Mosler B-6 lock which, as you can see from the wheel post , was seriously worn. 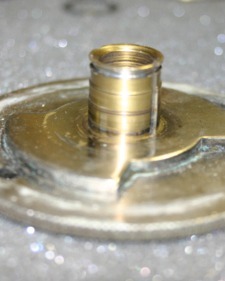 The wheel post shown in the photo should be smooth and of a single diameter. You can plainly see the wear from the three wheels that revolve around that post. Since there is so much wear, the wheels do not stay on the numbers to which they were set. 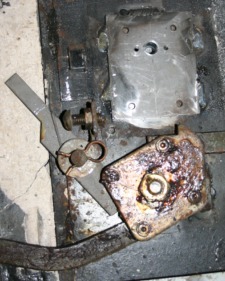 The problem now is the “footprint” of the lock. 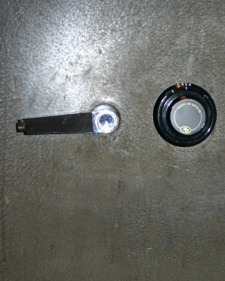 You can see the difference in the size of the locks and where the bolts are located. Since the Mosler mounting plate is very thin and welded to a hardened, drill resistant plate, we were forced to make our own mounting plate and weld it to the Mosler plate. This covered the old spindle hole on the inside and we then used carbide drill bits to make a spindle hole for the new lock. 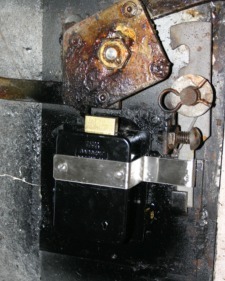 We used an epoxy liner to prevent the fireproof material from the hole from leaking into the lock case. The new Sargent & Greenleaf 6730 Group 2 combination lock is now in place on the new mount. 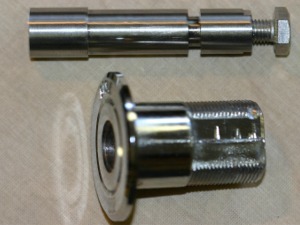 A custom fabricated relock hold back or strap was made from stainless steel. 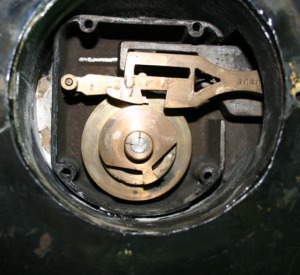 The original holdback was part of the lock mount. 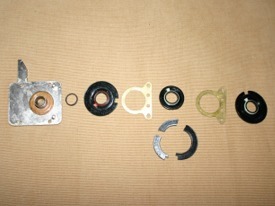 Originally, the back of the Mosler wheel pack stuck through the back cover. 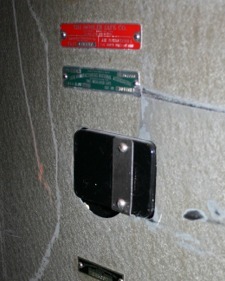 The back cover of the safe door was cut to accept the new S&G 6730 combination lock with stainless steel relock strap. 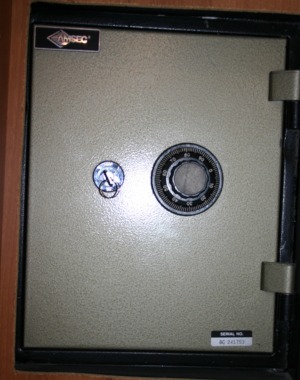 The Mosler safe now has a new Sargent & Greenleaf combination lock with black spyproof dial and ring. 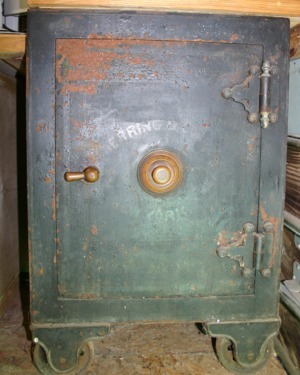 This antique Herring Farrell safe was opened by Bill Kushnick the owner of Bill's Lock, Safe & Security of Linden NJ 07036 without the need for drilling. 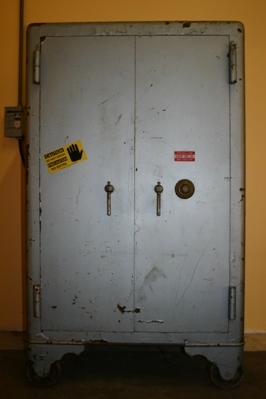 The safe was at a private residence in Forked River, New Jersey.